The temple of Sri Naganathaswamy is one among the nine Navagraha shrine in Tamil Naduis and is linked to Raaghu Bhagvan (Lord Rahu). 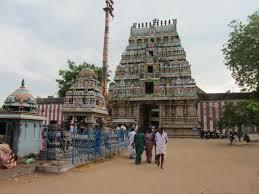 This holy place is placed at Tirunageswaram, 7 km from Kumbakonam, Thanjavur Region in Tamil Nadu. The primary presiding God of Thirunageswaram Temple is Lord Shiva (Lord Naganathaswamy) as well as his consort Goddess Parvathi (Giri Gujambika) who is preserved with Goddess Saraswati and Goddess Lakshmi next to Her. Rahu Bhagavan's can be observed with his consorts Nagakanni and Nagavalli. Serpents such as Adishesha, Karkotaka & Takshaka, devoted Lord Shiva on this position, resulting in name "Tirunageswaram". According to Hindu tale, the snakes' leader, Adisesha performed forfeit at this position, known as Senbaranya Kshetram due to the existence of huge amount of Senbaga plants. God Shiva was satisfied by his penance and showed up to him. As Lord Shiva provided an advantage to the Serpents' leader, he is known as Naganathar. Deity Girigujambal is considered to be devoting Lord Shiva here with Saraswathi, Lakshmi, Shasta, Muruga, and Ganesha. Still today Maha Bhairava is considered to be protecting and supporting the heavenly mother through her prayers. This Deity is supposed to be as Swayambu. Therefore, no abhishekam is conducted for the picture. As said in a Hindu tale, Indra got cursed by wise Gautama since he didn't behaved well with his wife Ahalya. It is thought that Indra praised Giri-Gujambigai by means of a fragrant content known as Punugu about 45 days, in order to acquire escape from sage's problem. Sages like Parashara and Gautama & leaders like Nala and Bhagiratha are supposed to have devoted Naganathar on this position. The Vinayaga shrine, Nandeeswarar Mandabam, Balibeedam along with Flag post (Thwaja Sthambam) can be seen on southeast entry. Ragu Bhagwan's statue is located in south-west area. The southeast part of shrine has water with four Mandaps, enclosed by a 100 pillars Mandap in a design of temple-car. The mandap's designed has creative support pillars (beams) in all instructions. The work of Dwarapalaga Sudhai on each part at the entry is an eye-catching function of the holy place. Lord Rahu is thought to be the reason for one's excellent status, position, company, commitment, successful over resistance, to journey international & for mantra energy. It is considered that by doing abishekam of Milk on Rahu Bhagwan during the period of Rahu kalam, the wait in planning a wedding, childlessness, married life problems, bad effects of Sarpa Dhosha, Kalasarpa Dhosha and Kalasthra Dhosha are all treated. A critical facet of Rahu shrine of Thirunageswaram is that while doing milk (dudh) abhishekam, the milk when added above the statue changes blue which is visibly noticeable. Huge numbers of enthusiasts throng here to execute the abishekam. 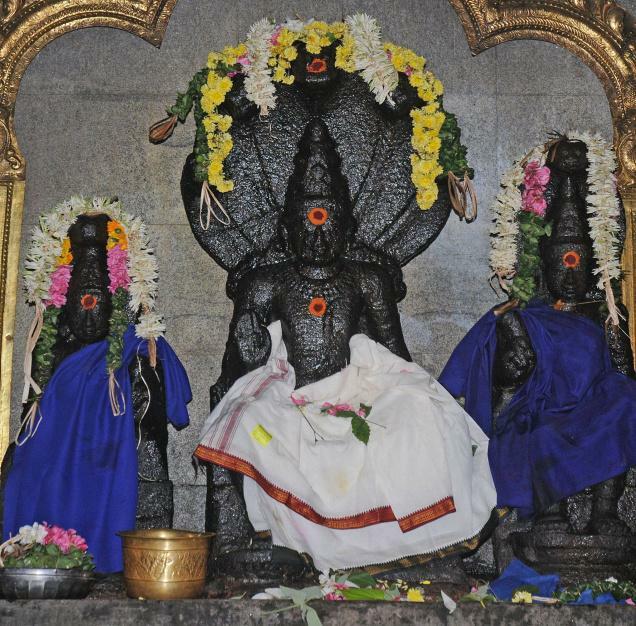 On every event of Rahu changing to next Rasi (Raasi) which occurs once in 1.5 years in anti-clockwise, unique Homam Abishekam is conducted at Shree Arulmigu Naganathaswamy shrine. Master Rahu is seized in parade in the Sesha Vahanam. The main occasions celebrated at this temple are Thiruvathirai (December � January), Kanda Shashti in the month of October/ November, Brahmotsavam in the month of November/ December, Navaratri and the Pooja of Sekkizhar Vaikasi (June) & Sivaratri (February - March).